Productivity and lifestyle blog Lifehack placed Webster University at the top of a list of "11 Best Colleges in America You Need To Know." The list singled out 11 schools "that stand out because they provide an educational experience that is tailored to the needs of students who are seeking more than just a standard 4-year degree. Each college in this list stands out because it has something unique and original to offer." The list, which calls Webster an "ideal choice for students who want the experience of studying abroad while maintaining a continuity in their education," also calls out Webster's Global Citizenship Program. Other schools noted for unique attributes on the list include Vanderbilt University, American University and Green Mountain College. Webster President Elizabeth (Beth) J. Stroble penned a column for Higher Education Today, the blog for the American Council on Education (ACE), discussing the use of social media in official capacities by leaders in higher education. Stroble, who is known as an early adopter of social media among higher ed presidents, traces her own interest in the platform to her own research into early email's effect on student writers, as well as to the visit by Twitter co-founder Jack Dorsey at Webster in 2009. "As social media evolves, I increasingly look for ways to use these channels for the purposes Zaiontz identified: community leadership, personal sharing and engaging with diverse accounts." "Teeter speaks with the confidence born of previous Variety Children’s Theatre musicals. He directed and choreographed all of them. And from the first, he held to high standards worthy of sellout shows. "The first indication of those standards: Lara Teeter." The show performs this weekend at Touhill Performing Arts Center. Representatives from the U.S. Department of Veterans Affairs (VA) were there for the opening and to speak to veteran students. Webster University is one of 10 universities in the country being visited by VA officials through the “Vet Success on Campus” (VSOC) program. See photos from the ribbon-cutting event in this Facebook album. 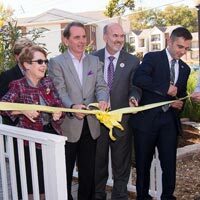 Pictured above: President Beth Stroble, Provost Julian Schuster, Military Affairs head Mike Callan and Student Vets Organization President Tom Palozola open the center.